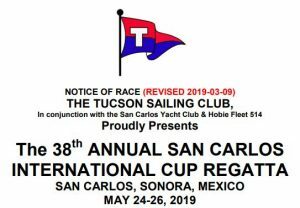 Events San Carlos Sonora 2019: monthly calendars of events, festivals and fiestas in San Carlos and Guaymas, Sonora, Mexico. Find out what’s going on. For more event and entertainment information, including a list of who’s playing where, and a daily calendar of what’s going on this week, subscribe to the free weekly entertainment newsletter. On event day, keep an eye on the local weather. April 2. SBPA Olé Mexico Dinner. 5:00pm, Club Deportivo. April 13. SBPA Bag of Books Sale. 10:00am – 2:00pm, Altered Tails Book Shoppe. April 14 – 21. Semana Santa (Easter week). April 30. Día Del Niño. continuing to May 19. ExpoGan Sonora and Palenque in Hermosillo. June 16. Father’s Day in Mexico, Canada & USA. December 7. 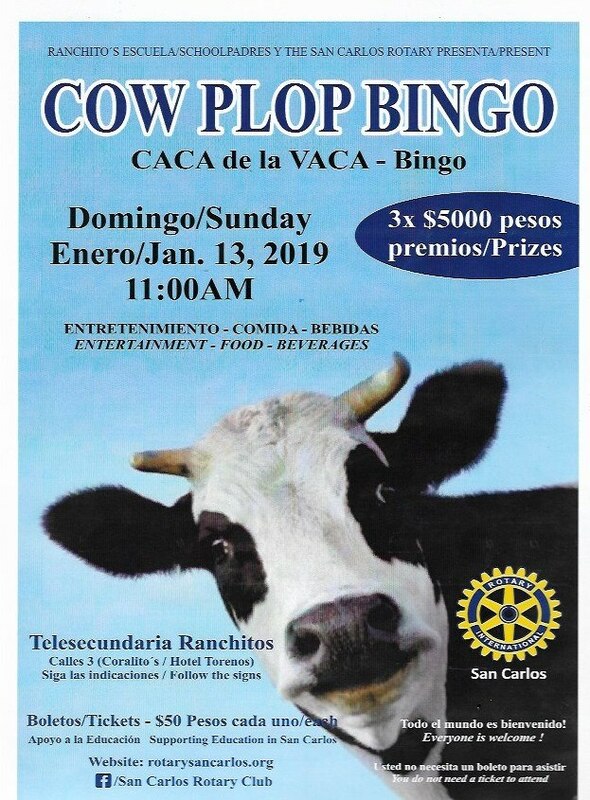 Annual SBPA Tianguis. 8am – 1pm, Clinic Bldg, Ranchitos Road. June 1. 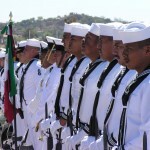 Dia de la Marina (Mexican Navy Day). Official Mexican holiday. Celebration in Guaymas. June 1 – 3. 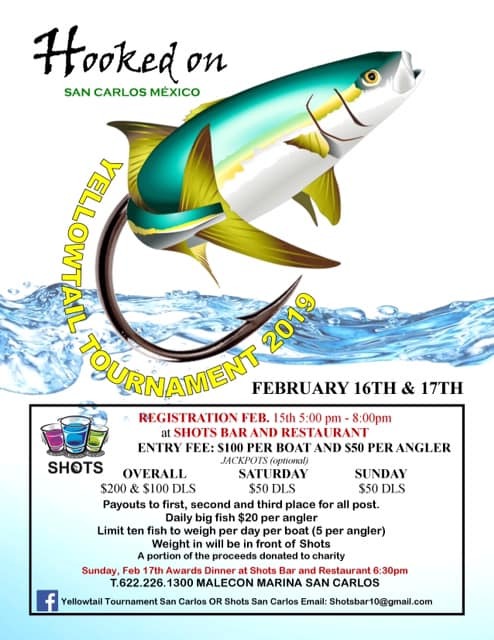 Yacht Club / Rescate Fishing Tournament. June 16. Bag of Books Sale. 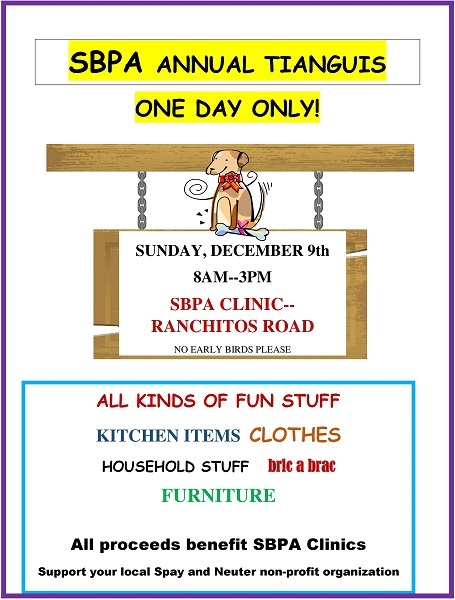 10am to 2pm, Altered Tails Book Shoppe. July 12 – 15. 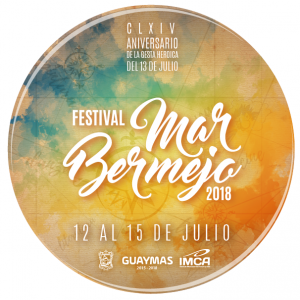 Annual Festival del Mar Bermejo. 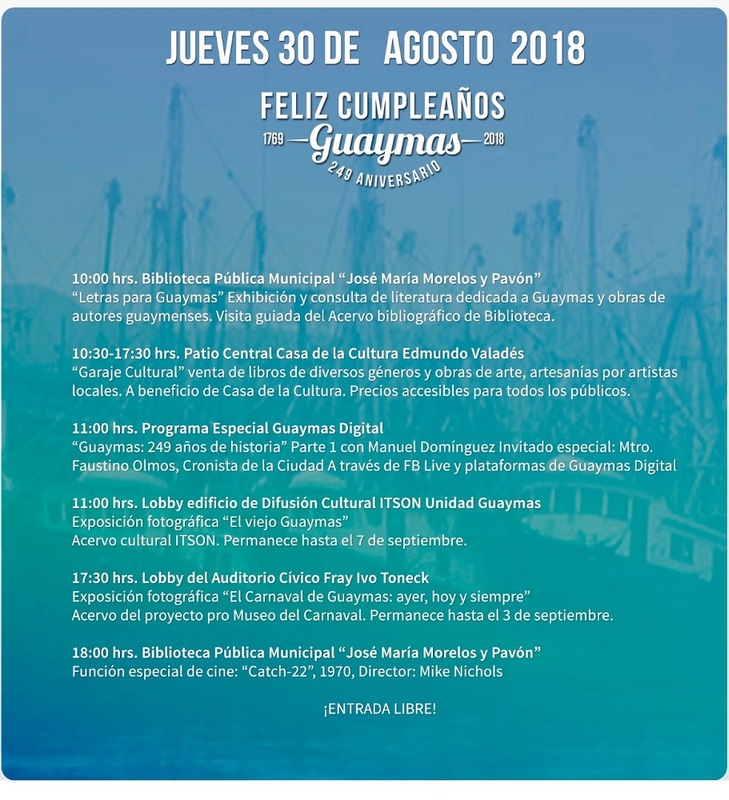 To commemorate the anniversary of The Battle of Guaymas, which occurred on July 13, 1854. July 13 – 15. 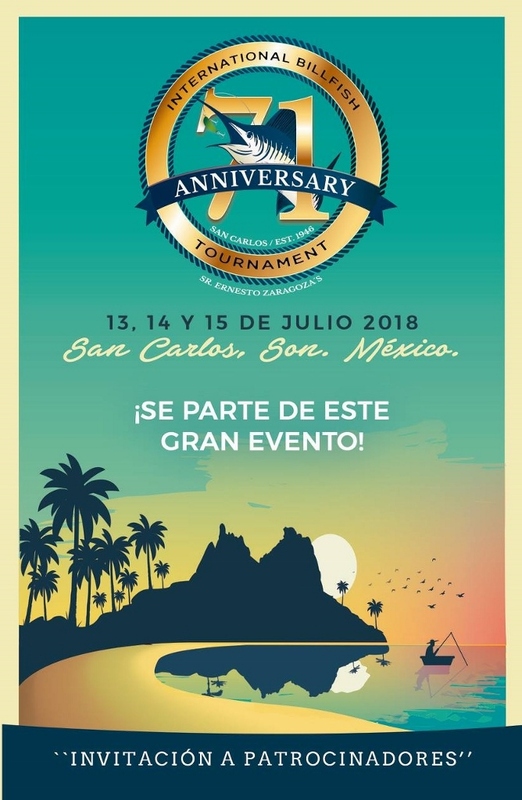 71st International Billfish Tournament (Ernesto Zaragoza Foundation). July 18. Anniversary of the death of President Benito Juárez (March 21, 1806 to July 18, 1872). July 21. 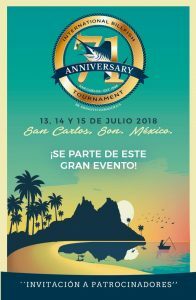 Sonora PADI Women´s 2018 beach cleanup. More info. July 21. 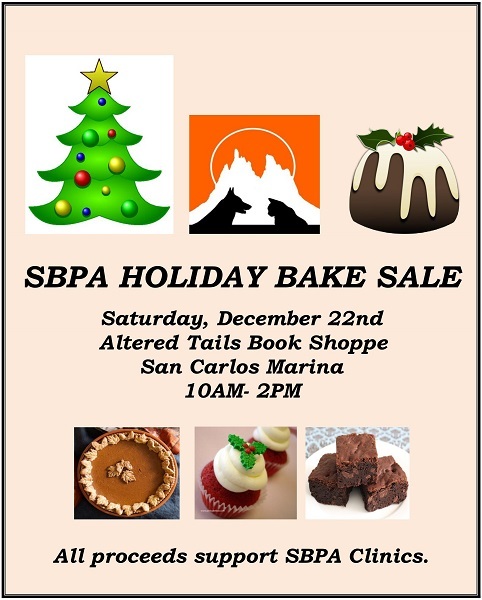 SBPA Bag of Books Sale. 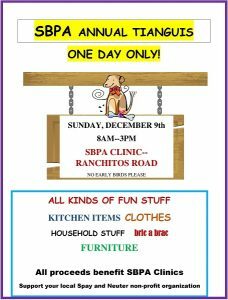 10am to 2pm, Altered Tails Book Shoppe. July 30. Anniversary of the death of Miguel Hidalgo, leader of the Mexican War of Independence (May 8, 1753 to July 30, 1811). This is NOT a national holiday. August 8. Anniversary of the birth of Emiliano Zapata (b.Aug 8, 1879, d.April 10, 1919). August 18. SBPA Used Bag of Books Sale. 10am – 2pm, Altered Tails Book Shoppe. August 31. 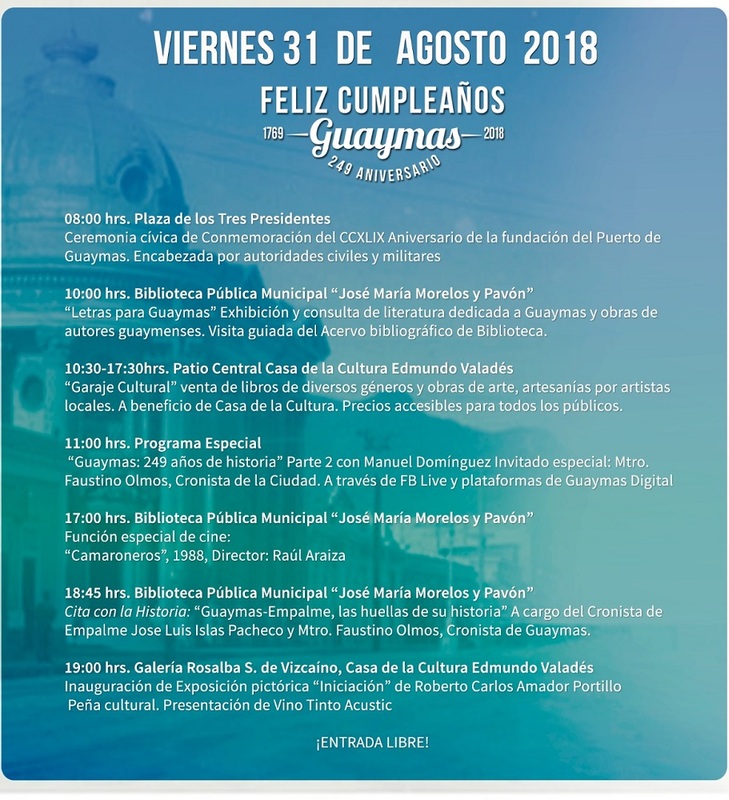 Guaymas Anniversary (see schedule in images below). On August 31, 1769 José de Gálvez founded the town of Guaymas and assigned the first plots. August 31 – September 1. 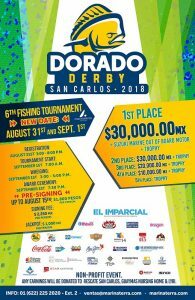 6th Annual Marinaterra Dorado Derby Fishing Tournament. September 1. Annual State of the Union. September 3. Labor Day (USA & Canada). September 13. Los Niños Héroes, Hero of the Mexican-American War 1847. Battle of Chapultepec. September 15. SBPA Used Bag of Books Sale. 10am – 2pm, Altered Tails Book Shoppe. September 15. New Mayor of Guaymas, Sara Valle Dessens, sworn into office. September 16. Día de la Independencia / Mexican Independence Day. 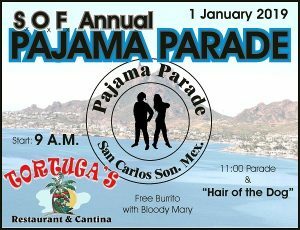 Parade in Guaymas. Mayor’s State of the City address in the Guaymas Auditorium. October 5 – 7. San Carlos Hammer Down Tournament (formerly the Labor Day Tournament). October 10. 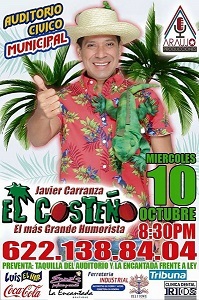 Comedian Javier Carranza “El Costeño”. 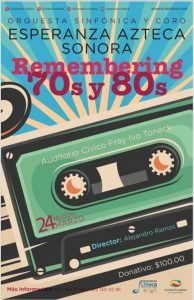 8:30pm, Guaymas auditorium. October 12. Día de la Raza / Day of the Races (not an official holiday). October 12. 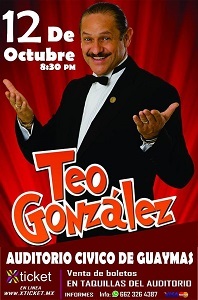 Comedian Teo González. 8:30pm, Guaymas auditorium. October 13. Guaymas Fútbol Club first home game against Caborca. 7pm at Estadio Julio Alfonso Alfonso. October 14. 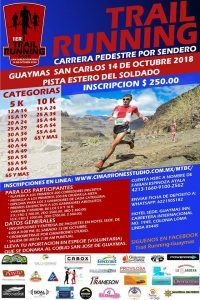 Trail Running Race. 7:30am, Pisa Estero del Soldado. October 14. 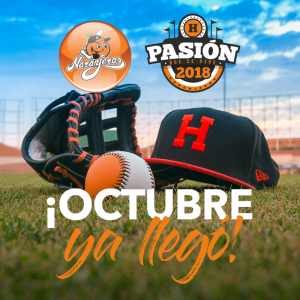 Naranjeros de Hermosillo baseball gets underway in October. October 14 is the first home game, at 6pm vs Mexicali. October 17. Mark Mulligan Welcome Back San Carlos Party. 5pm, La Palapa Griega. La Palapa will have all-you-can-eat BBQ baby back ribs and chicken served with Greek salad and baked potato for 200 pesos. October 20. SBPA Used Bag of Books Sale. 10am – 2pm, Altered Tails Book Shoppe. October 22. Castaway Kids meeting. 10am, La Palapa Griega. October 24. Full Moon Party. 5pm, Soggy Peso. October 26 – 28. 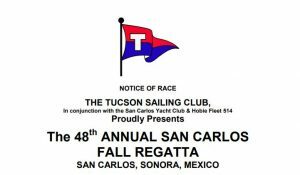 Tucson Sailing Club’s Annual Fall Regatta. October 26, 27 & 28. Festival de la Calaca. Plaza de la Pistola, Guaymas. October 27. Guaymas Fútbol Club. 6pm at Estadio Julio Alfonso Alfonso. October 28. Halloween Monster Smash Pickleball tournament. 8:30am, Mirador Courts. October 29. Omar’s Silent Horror Movie Show, Phantom of the Opera. 6pm, La Casa de Paja Studio in Ranchitos. October 27 – 31. 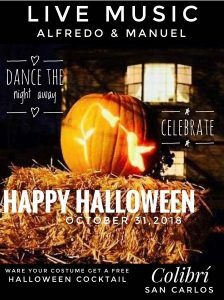 Halloween Parties. November 1-2. All Saints Day & Day of the Dead (Día de los Muertos) is an important Mexican holiday. November 1. First Bird Outing of the Season. 7:30am, Esterito Cafe. November 1. Men’s golf league starts and continues every Thursday. For more information, contact Jim McAdie at jimmcadie@gmail.com or 226-1637. November 1. Youth Philharmonic Orchestra. 6:30pm, Sunset Bar & Grill. November 2. Día de Muertos (Day of the Dead). November 3. Bahia Storage Tianguis / Open Flea Market. 8am – 11am, Bahia Storage. November 3. 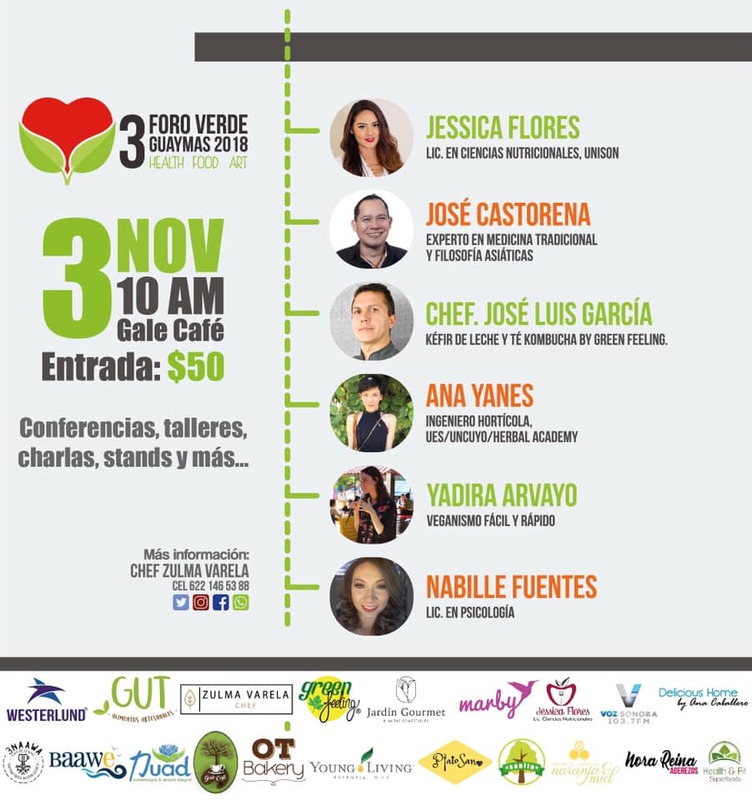 Tercer foro verde. 10am, Gale café. November 3. Day of the Dead Catrina Party. Colibri. November 3. Kirtan sacred chanting with Cherie Althauser. Dusk, La Casa de Paja. November 3. 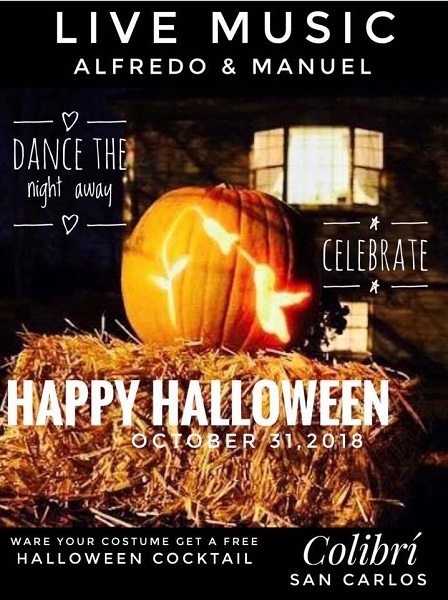 Festival Hallowauu. 4:30pm – 7:30pm, Casa de la Cultura. November 3. Guaymas Fútbol Club vs Huatabampo. 6:30pm at Estadio Julio Alfonso Alfonso. November 4. 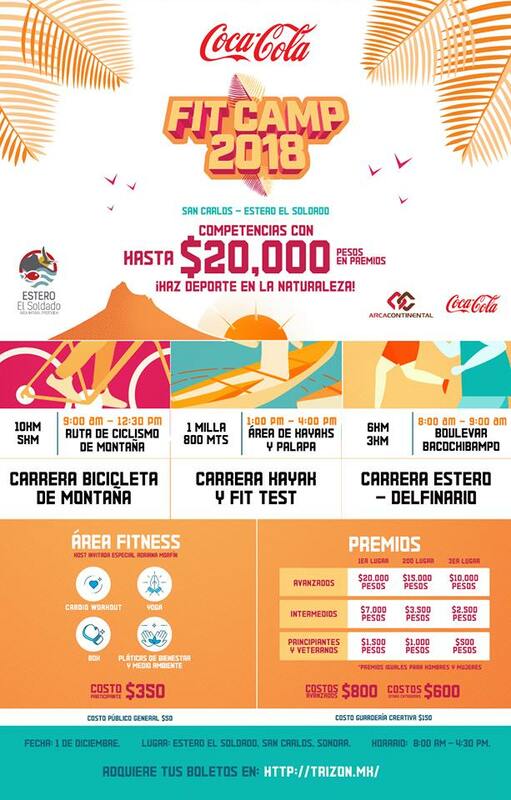 3rd stage Serial MTB Sonora (mountain bike race). November 4. Fiesta Patronal San Carlos Borromeo 2018. 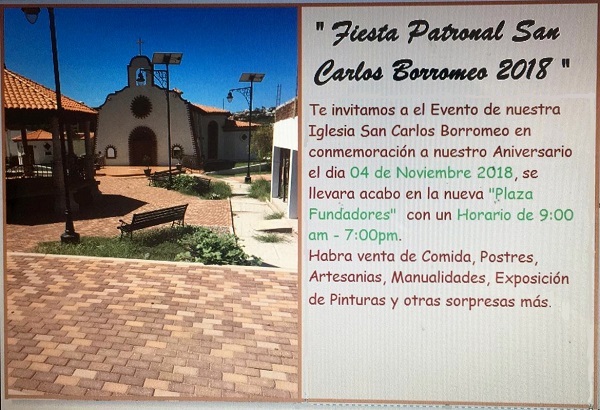 9am – 7pm, San Borromeo Church. November 5. 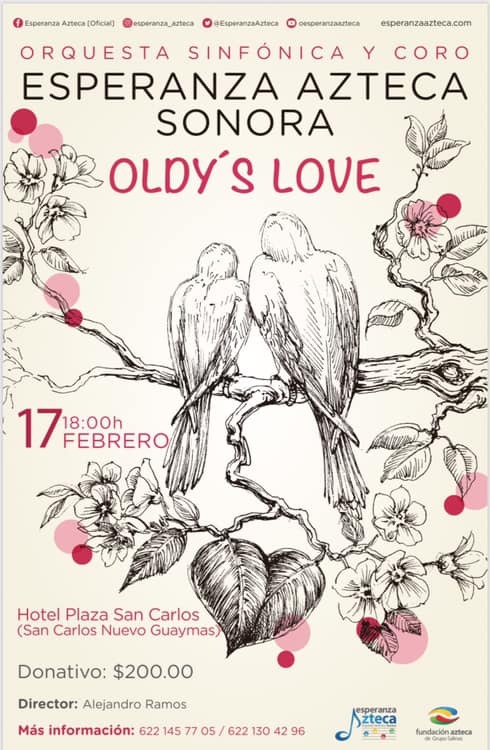 Omar’s Silent Comedy Movie Show with live music. 6pm, Colibri. And every Monday after. November 6. Women’s golf starts. The Ladies 18 Holers tee off at 9am every Tuesday. Non-members are welcome. 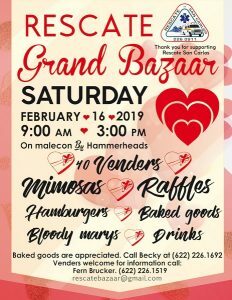 For more information, please contact Mary at 226-0156. November 7. SBPA Event Planning Meeting. 10:30am, San Carlos Country Club. November 8. 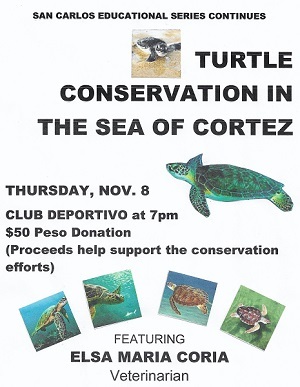 Education Series: Turtle Conservation in the Sea of Cortez. 7pm, Club Deportivo. November 9. Dinosaurios El Espectaculo en Vivo. 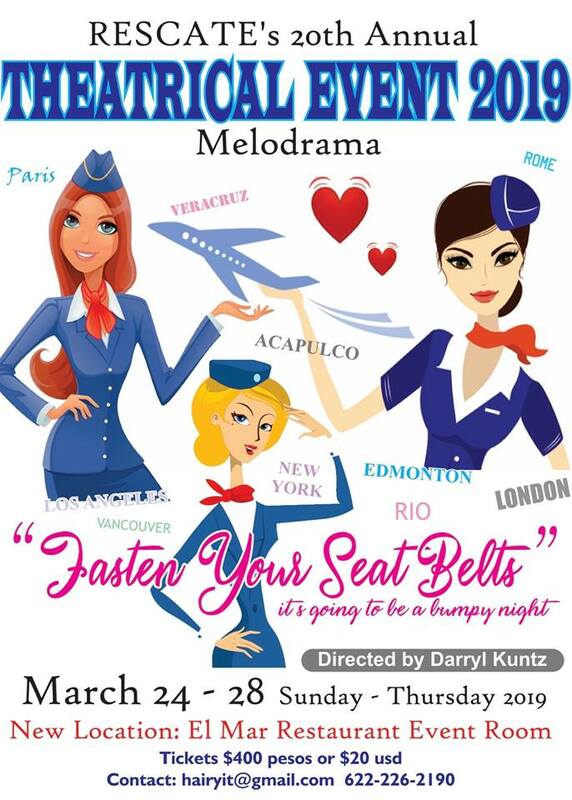 5:30pm or 7:30pm, Guaymas auditorium. November 9. Pink Party. 6pm, Shots Bar, Club & Restaurant. November 10. 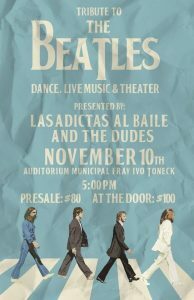 Tribute to The Beatles with The Dudes, Las Adictas al Baile, Ready, Set, Dance and sooooo much more! 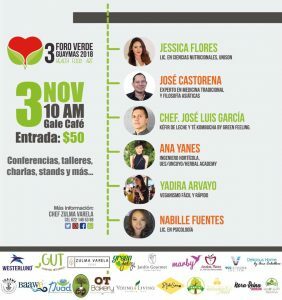 5pm, Guaymas Auditorium. November 12. Castaway Kids meeting. 10am, La Palapa Griega. November 15. Rescate Welcome Back Margarita Party. 5pm, Marinaterra Beach Club. November 15. Education Series: Roaming North America with Smart Phones. 7pm, Club Deportivo. November 16 – 19: Buen Fin. November 16 – 18. Mexican Beach Volleyball Tour. San Francisco Beach. November 16. Huge Book Sale. 9am to 2pm, The Community Library at Tecalai. November 16. Teo Gonzalez. 8:30pm, Guaymas Auditorium. November 17. Bahia Storage Tianguis / Open Flea Market. 8am – 11am, Bahia Storage. November 17. Mindfulness Meditation Workshop. 10am -1 pm, La Casa de Paja. November 17. SBPA Used Bag of Books Sale. 10am – 2pm, Altered Tails Book Shoppe. November 17. Six and a Half Mexicans with Mark Mulligan. 6pm, La Palapa Griega. November 17. Guaymas Fútbol Club vs La Tribu de Cd. Jua´rez. 6:30pm, Estadio Julio Alfonso Alfonso. November 17. DiscoMar San Carlos. 9pm, El Mar Restaurant. November 18. 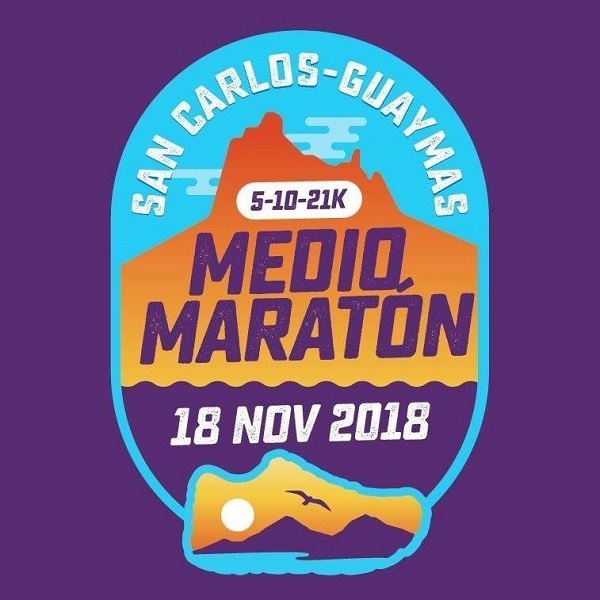 Medio Maratón San Carlos. November 18. 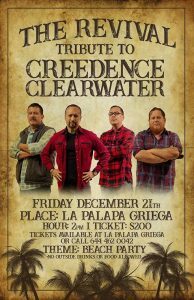 Esperanza Azteca concert. 5pm, San Carlos Plaza. November 19. Día de la Revolución (Revolution Day) observed third Monday in November, originally November 20. This official Mexican holiday commemorates the Mexican Revolution of 1910. School parade down the blvd. November 19. Karaoke Party. 6pm, Club Deportivo. November 22. Thanksgiving dinners around town (USA Thanksgiving). November 24. 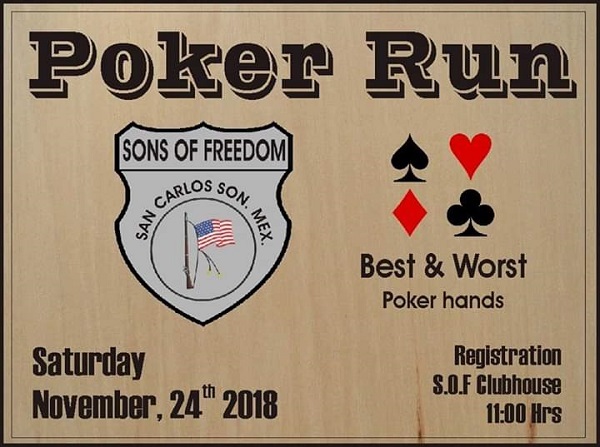 Sons of Freedom Poker Run. 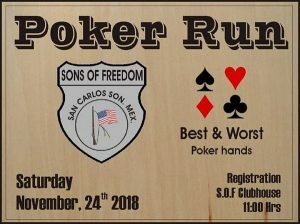 11am registration at SoF Clubhouse. November 26. Club Deportivo Board Meeting. 8:30 am, Club Deportivo. November 30, December 1 & 2. Introduction to Kundalini Yoga Workshop with Deborah Leatherwood. La Casa de Paja. December 1. 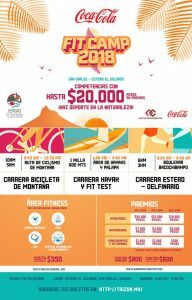 Fit Camp 2018. 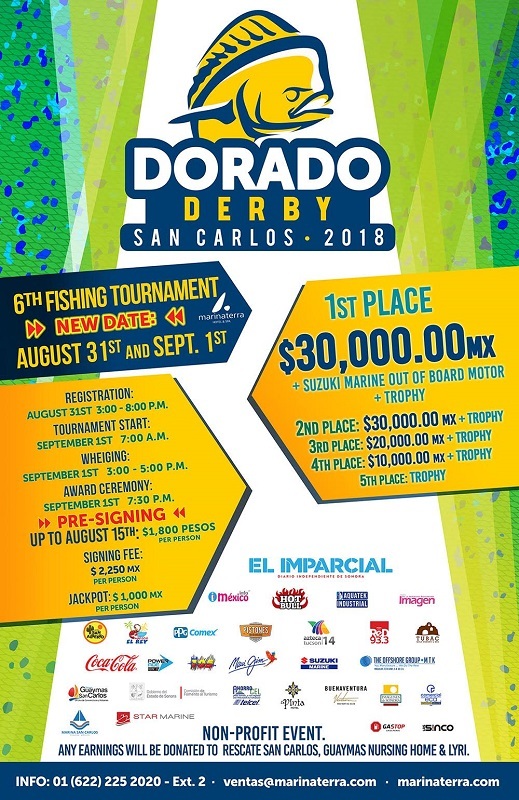 8am – 4:30pm, Estuary del Soldado. December 1. Tianguis / Open Flea Market. 8am to 11am, Bahia Storage. December 1. 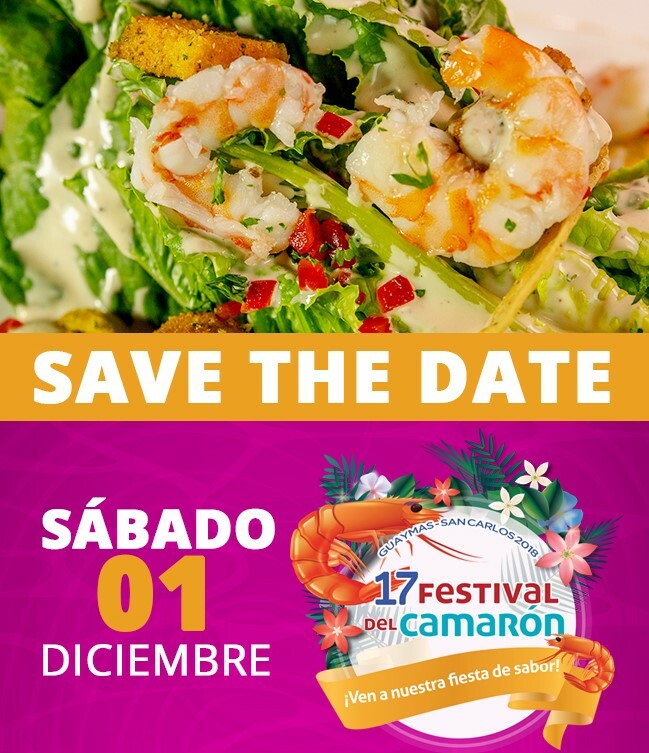 Festival del Camarón. 12pm – 6pm, Guaymas Malecon. December 1. 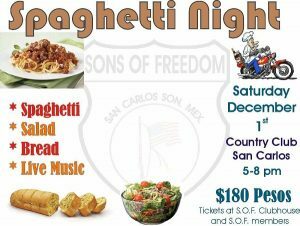 Sons of Freedom Spaghetti Dinner Fundraiser. 5pm, San Carlos County Club. December 1. 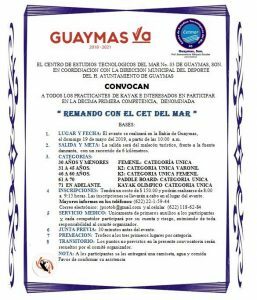 Guaymas Fútbol Club vs He´roes de Caborca. 6:30pm, Estadio Julio Alfonso Alfonso. December 5. SBPA Event Planning Meeting. 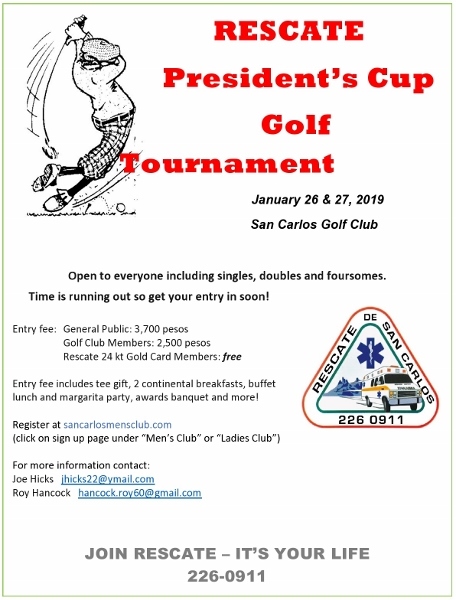 10:30am, San Carlos Country Club. December 6. The first lighting of the San Carlos Christmas tree. 5pm, in the Plaza las Palmas next to Colibrí Restaurant. December 7. Rescate Auxiliary Meeting. 9am, Colibri. December 7. Soul Motion Dance. 5:30pm to 6:30pm, La Casa de Paja. More info. December 7. Christmas Parade in Guaymas. 4:30pm along Serdan to 3 President’s Plaza. December 8. Tecalai community yard sale. 8am – 1pm, Tecalai. December 8. 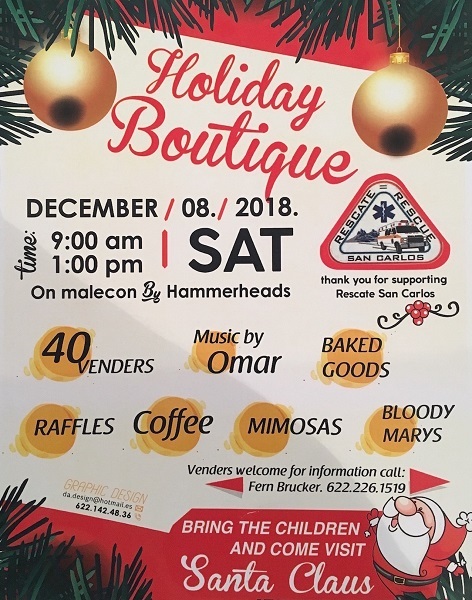 Rescate Holiday Boutique. 9am – 1pm, on the San Carlos Malecon near Hammerheads. December 8. FREE Kirtan, Sacred Chanting. 5:30pm – 7:30pm, La Casa de Paja. More info. December 8. Guaymas Fútbol Club vs Futbol Premier Club. 6:30pm, Estadio Julio Alfonso Alfonso. December 9. 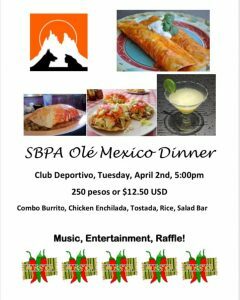 SBPA Annual Tianguis. 8am-3pm, SBPA Clinic Building on the Ranchitos Road. December 9. 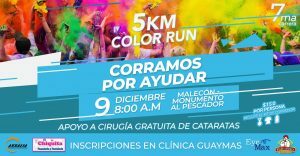 Color Run. 8am, Guaymas Malecon. December 10. Castaway Kids meeting. 10am, La Palapa Griega. December 10. SBPA Holiday Shopping Party. 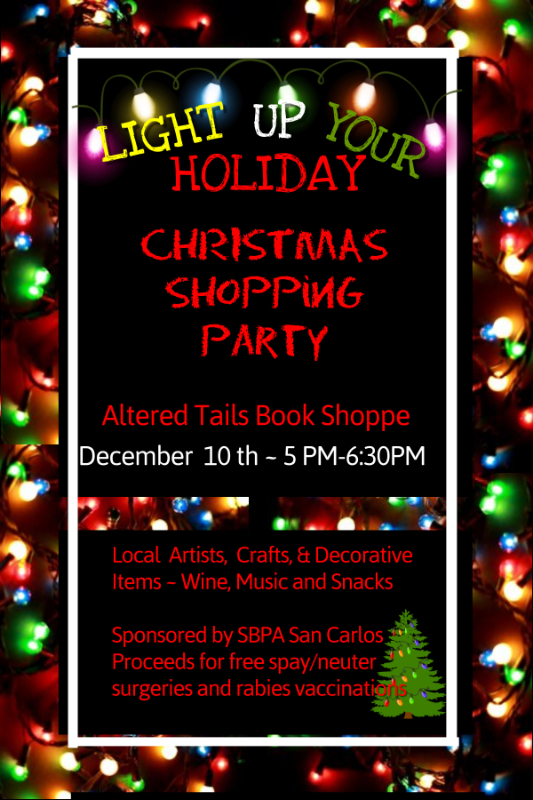 5pm – 6:30pm, Altered Tails Book Shoppe. December 11. 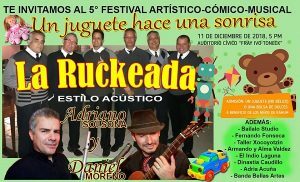 5th festival “Un juguete hace una sonrisa” (A toy makes a smile). 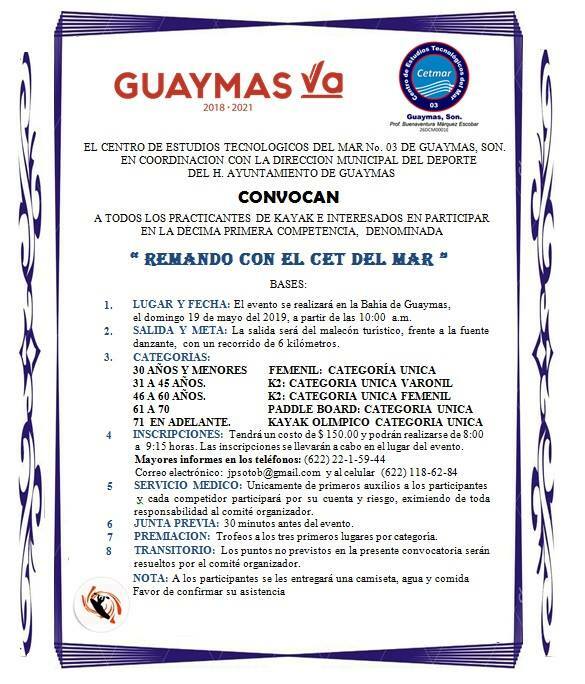 5pm, Guaymas Auditorium. December 12. Día de Guadalupe (Day of Our Lady of Guadalupe). December 13. Twilight Christmas Cocktail party. 4pm, San Carlos Style. December 13. Jay Barwell photo exhibit “Metamorphosis: Images Created and Re-created”. 4pm – 7pm, Galeria Bellas Artes. December 13. Hawaiian Outrigger canoe talk. 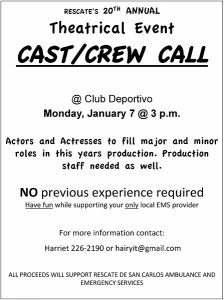 7pm, Club Deportico. December 15. Club Deportivo Welcome Back breakfast. 7:30am – 11am, Club Deportivo. 150 pesos. December 15. Tianguis / Open Flea Market. 8am to 11am, Bahia Storage. December 15. Sun & Holiday Fun Round Robin Pickleball Tournament. December 15. Colibrí Community Gallery Show. 10am – 2pm Colibri. December 15. An Introduction to Taoist Sacred Femininity. 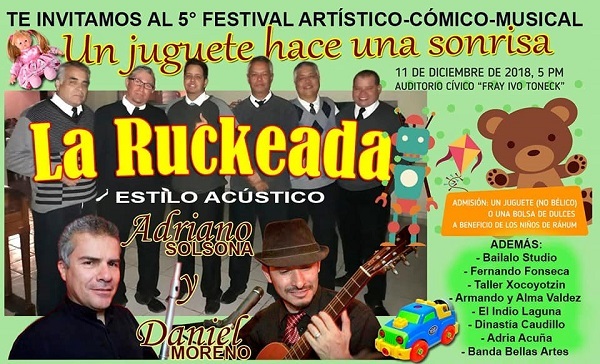 10am – 1pm, La Casa de Paja. More info. December 15. Colibri Community Art Show. 10am – 2pm, Colibri. December 15. SBPA Used Bag of Books Sale. 10am – 2pm, Altered Tails Book Shoppe. December 15. Open Art Studio and Sale. 12 noon – 4pm, at The Loft Studio, 467 Langosta, Caracol Peninsula. December 15. Orquesta Filarmonica Juvenil Christmas Concert. 7pm, Guaymas Auditorium. December 16. Men’s & Women’s Holiday Golf Tournament. Shot Gun starts at 10:00am. December 16. Tamale Festival. 10am, Plaza Tinaco in Emplame. December 16. Galeria GCM Art Exhibition. 5pm at Seascape Plaza. December 16. 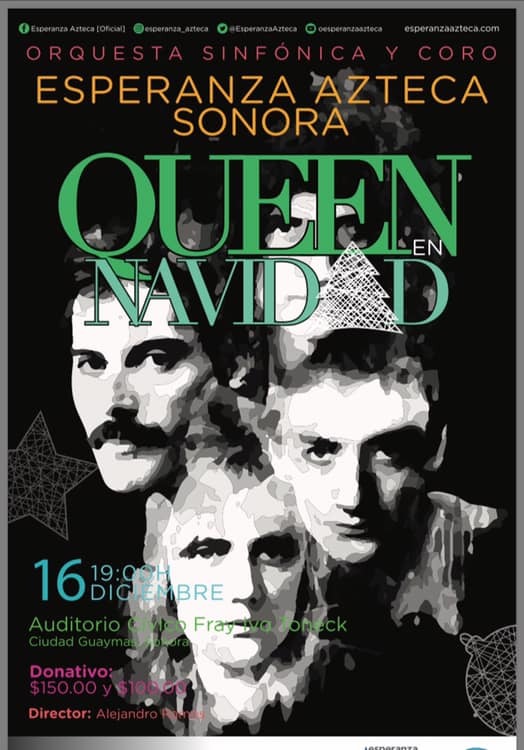 Esperanza Azteca Tribute to Queen. 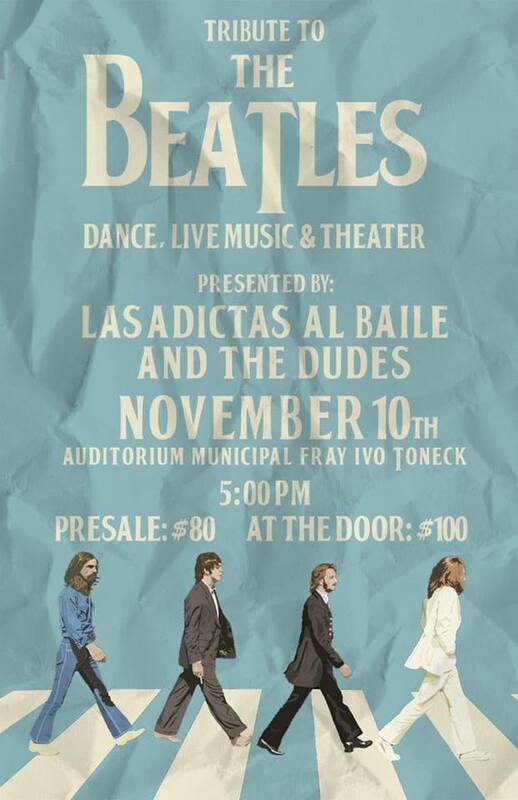 7pm, Guaymas Auditorium. December 16-24. Las Posadas – nine days of traditional festivities. December 19. Sixth Annual La Manga Christmas Party and Posada. 11am, La Manga Elementary School. December 21. Rescate Auxiliary Meeting. 9am, Colibri. December 21. 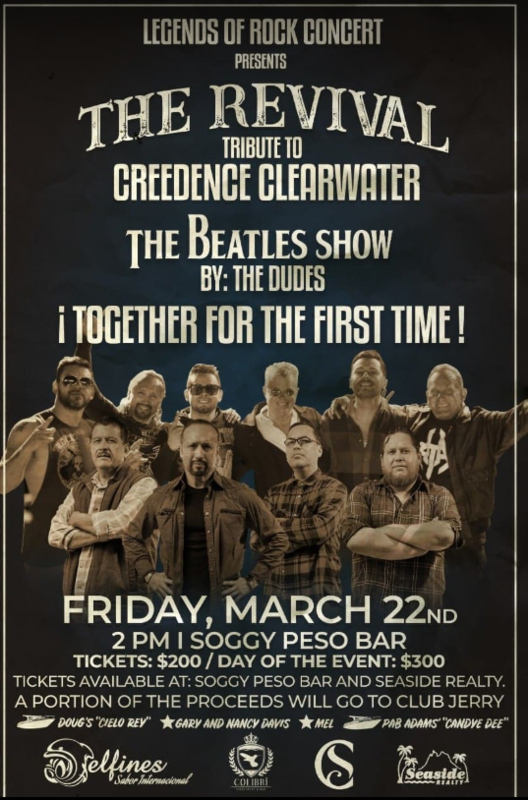 The Revivals Tribute to Creedence Clearwater Revival. 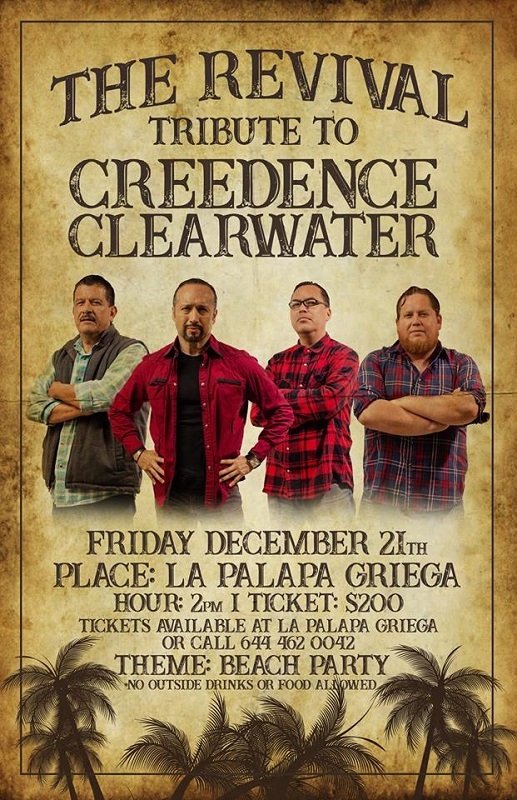 2pm, La Palapa Greiga. December 22. 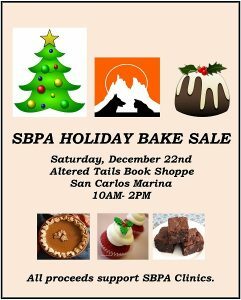 SBPA Holiday Bake Sale. 10:00am – 2:00pm, Altered Tails Book Shoppe. December 22. Castaway Kids Christmas Sing Along with Sam Rainwater and Susan King. 4pm – 6pm, Shots. December 22. DiscoMar San Carlos. 9pm – 3am, El Mar restaurant. December 24. Club Deportivo Board Meeting. 8:30 am, Club Deportivo. December 24. Noche Buena (Christmas Eve). Christmas Eve dinners around town. December 24. 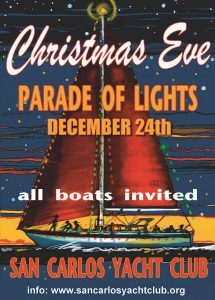 Yacht Club Parade of Lights. Watch the Parade of Lights from La Palapa Griega, El Mar Restaurant, Los Arbolitos, Turquesa or the beaches. December 25. Navidad (Christmas Day). List of dinners, parties, etc. December 25. Community Christmas dinner. 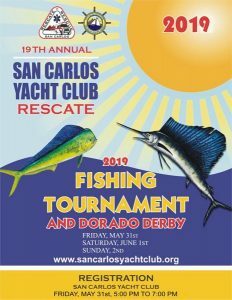 Doors open at 1pm and dinner is at 2pm, San Carlos Yacht Club (sponsored by Barracuda Bob’s). December 28. Día de los Santos Inocentes (The Holy Innocents) is a National Holiday similar to April Fools’s Day, celebrated with lots of practical jokes. December 30. Celebrate New Years Eve-Eve with Sam Rainwater. 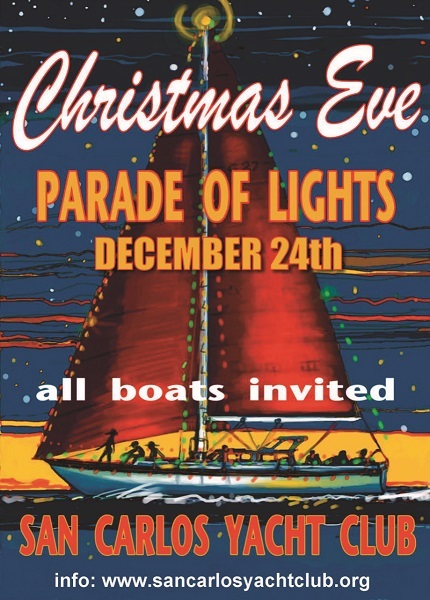 4pm – 7pm, HammerHead’s Dockside Bar & Grille. December 31. Fin de Año/New Years Eve. List of special dinners and parties. January 1. Año Nuevo / New Years Day is an official Mexican holiday. January 1. Sons of Freedom Pajama parade. 9am at Tortuga’s. January 4. Rescate Auxiliary Meeting. 9am, Colibri. January 5. Bahia Storage Open Flea Market / Tiangius. 8am to 11am. January 6. Día de los Reyes Magos. January 7. 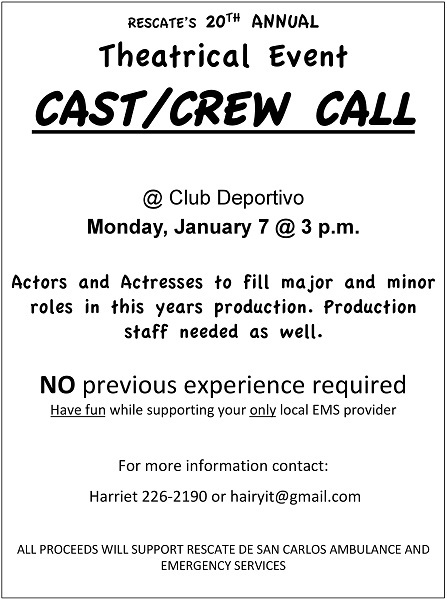 Cast call for Rescate Theatrical Event. 3pm, Club Deportivo. January 8. Mark Mulligan. 6:00pm, San Carlos Community Church. debuts brand new songs off his upcoming “Rising Son” album. That night, all door donations and album sales will go to charity. The show starts at 6:00pm. All are welcome, regardless of denomination. January 10. Education Series: Smart Phones for Dummies. 7pm, Club Deportivo. January 13. Rotary’s Cow Plop Bingo. 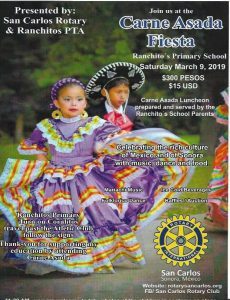 11am – 3pm, Telesecundaria (Jr High School) in the Ranchitos. January 15. Christine McGrath & Ben Johns Pickleball Clinics. More info. January 15. Rotary Club of San Carlos. Introduction to Rotary meeting and luncheon. 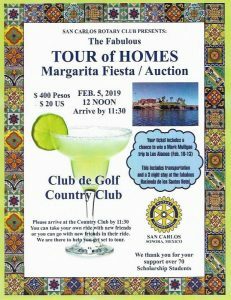 11:30am at the San Carlos Country Club. January 17. Education Series: Ex-Pat Health Care, Hospitalization & Dying in Mexico. 7:00pm, Club Deportivo. January 18. Rescate Auxiliary Meeting. 9am, Colibri. January 18 – 26. 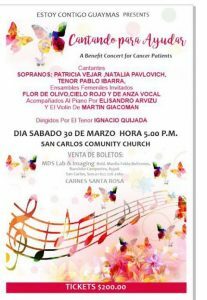 FAOT Music Festival in Alamos. Program. January 19. Bahia Storage Open Flea Market / Tiangius. 8am to 11am. January 19 – 20. Art League Art Show. 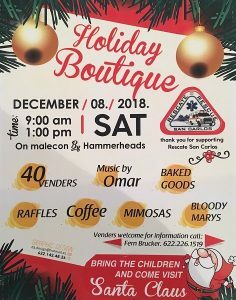 Saturday from 9am – 3pm and Sunday from 10am to 2pm at Tecalai Club House. January 19. SBPA Bag of Books Sale. 10am – 2pm, Altered Tails Book Shoppe. January 19 & 20. Therapeutic Yoga Workshop. 10:00am to 1:00pm, La Casa de Paja. $60 USD per class. Space is limited, so register early. Call 226-0119 or write to kathybereza@hotmail.com to register. January 19. Club DePortivo Filet Mignon Steak Dinner. 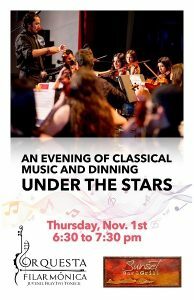 Doors open at 4:30 pm and dinner served at 5:30pm. January 20. 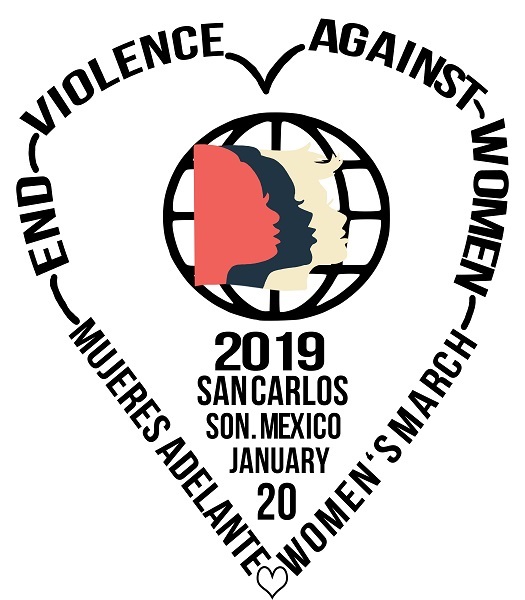 Women’s March San Carlos-Mujeres Adelante. 10am – 2pm. January 21. Eric Holland Full Moon Show. 3:00pm – 5:30pm, Soggy Peso. January 23. SBPA Luncheon and Fashion Show. 11am – 2pm, San Carlos Plaza. January 25. First meeting of the Photography Group. 8:30am, Tequila’s. For more info contact Rick Hadley via WhatsApp 622-176-1461 or email rhadley8161@gmail.com. January 25. 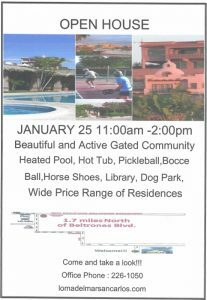 Loma del Mar Open Houses. 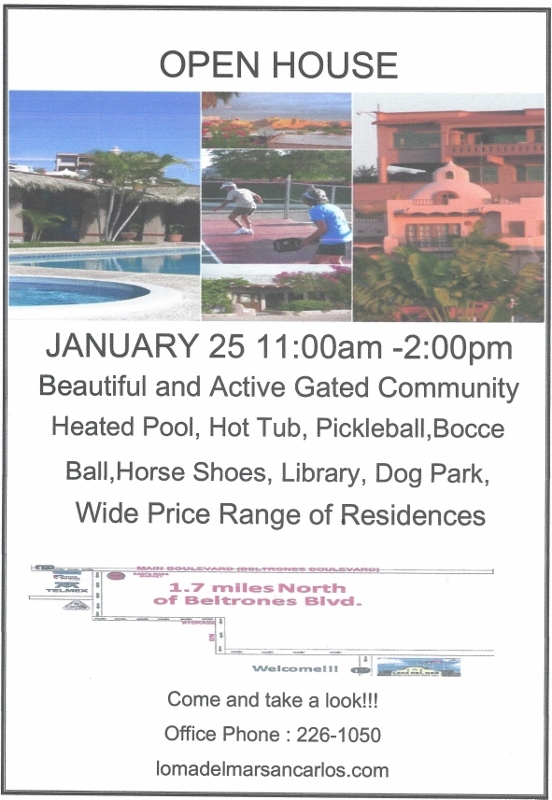 11:00am – 2:00pm, Loma del Mar. January 26. Visiting artist Mike Nash joins Mark at La Palapa Griega. January 31. Basic Techniques of Painting with Alcohol Inks. 10:00am, Club Deportivo. January 31. Grand Opening Party. 4pm – 6pm, San Carlos Style. February 1. 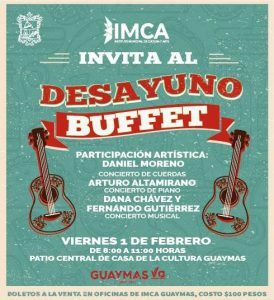 Breakfast Buffet and Live Music. 8:00am, Casa de la Cultura. February 1. Rescate Auxiliary Meeting. 9am, Colibri. February 3. Super Bowl 53 showing in sports bars and restaurants around town. 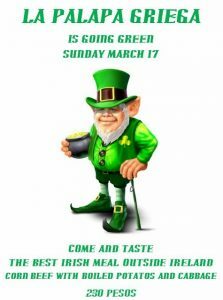 See list of locations and food & drink specials. February 3 – 11. Scott Moore Pickleball Boot Camp & mini clinics. February 4. Día de la Constitucion (Constitution Day) is February 5, but is observed the first Monday in February. It is a public holiday. February 5. Boating Education: First Aid for Boaters. 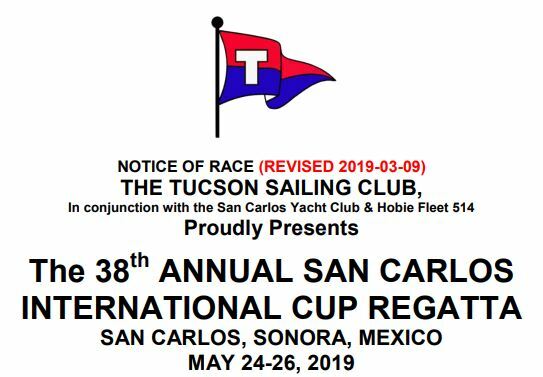 10:00am, San Carlos Yacht Club. February 5. Rotary’s Tour of Homes. 12pm, San Carlos Country Club. February 5. Mark Mulligan at Rotary Club Event. San Carlos Country Club. February 7 to 11. Sombrero Showdown and Amigos Cup Pickleball Tournament. More info. February 7. San Carlos Educational Series “Whale Tales”. 7:00pm, Club Deportivo. February 12. Boating Education: The San Pedro Conservation Effort. 10:00am, San Carlos Yacht Club. February 13. Join Castaway Kids for a Fundraising Event to support the new Steel Pan Band of San Carlos. 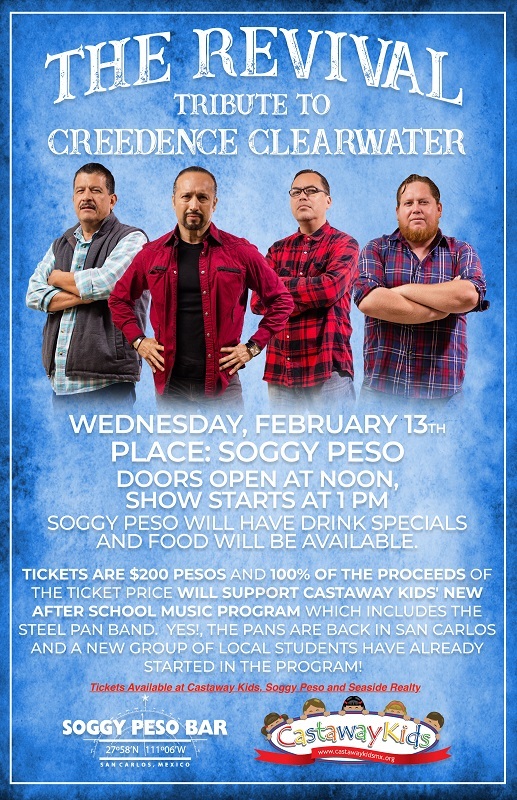 Enjoy the music of The Revival Tribute to Creedence Clearwater on the beach at Soggy Peso, 1:00pm – 3:00pm. February 14. Valentines Golf Tournament. February 14. Valentine’s Day. Specials dinners around town. February 15. Rescate Auxiliary Meeting. 9am, Colibri. February 15, 16 & 17. 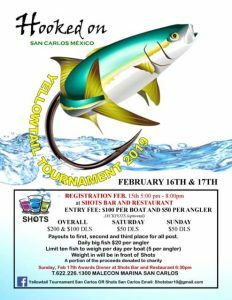 Yellowtail Tournament. February 15. Noche Bohemia: Bread & Wine with Fausto León and Conchita Khenany. 8:00am, Casa de la Cultura. February 16. 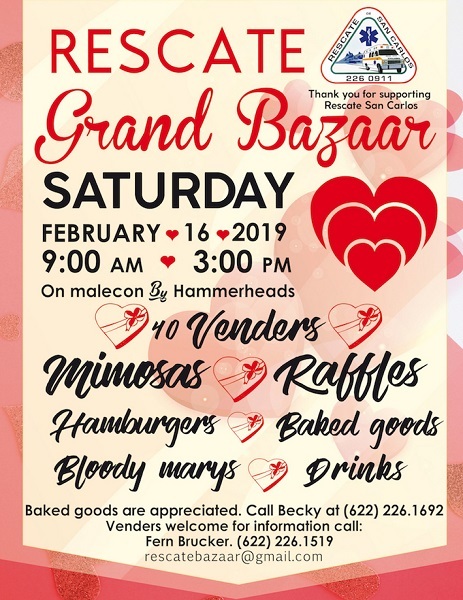 Rescate Grand Bazaar. 9am – 3pm, location TBA. February 16. 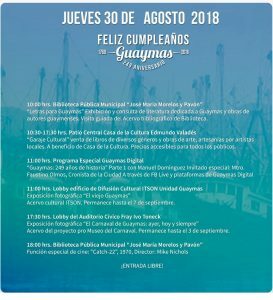 Opera Guaymas: Opera y Musica Mexicana. 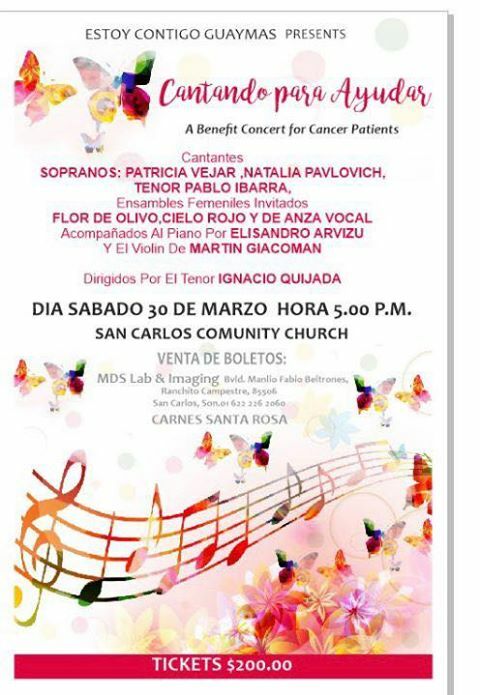 6:00pm, Guaymas Auditorium. February 17. 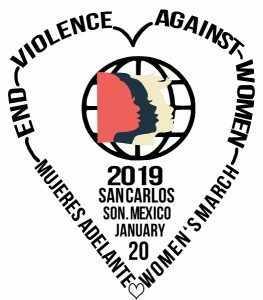 Walk for Life / Caminata por la Vida. 8 am at La Palapa Beach. Walk starts at 9am. February 17. Esperanza Azteca Orchestra Retro Concert. San Carlos Plaza. February 21. Basic Techniques of Painting with Alcohol Ink Class. 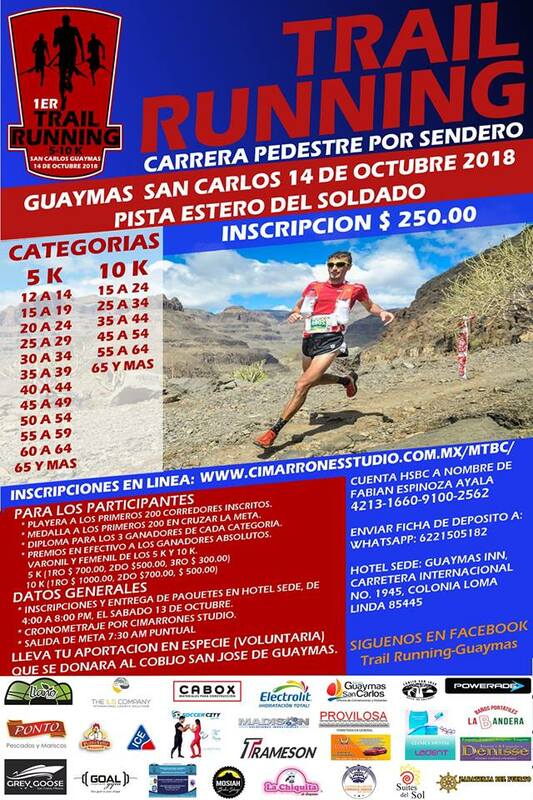 10:00am – 1:00pm, Club Deportivo. February 21. Parrot Heads of San Carlos “Up Close and Personal” House Concert with Kelly McGuire. 2:00pm, Villa Hermosa. February 21. 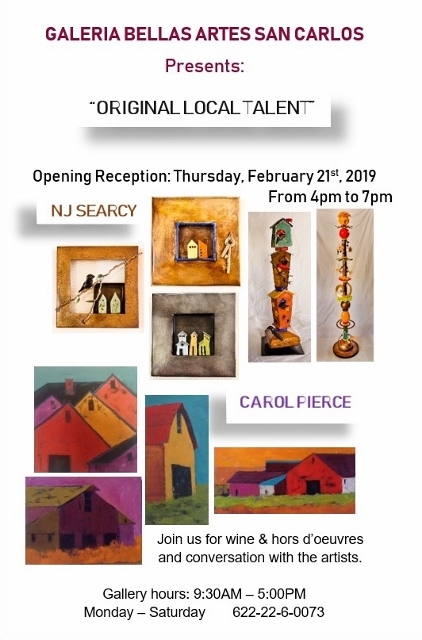 Art Opening featuring NJ Searcy and Carol Pierce. 4pm – 7pm, Galeria Bellas Artes. February 21. San Carlos Educational Series “Sea Lion Disentanglement Campaign”. 7pm, Club Deportivo. February 22. Dirty Pour Technique Class. 3pm – 5pm, Colibrí Restaurant & Bar. February 22. Friday Night Dance. 6:30pm – 8:30pm, Club Deportivo. Feb 22, 23 & 24 : 10-hr Gentle Somatic Yoga Workshop with Leslie Young. La Casa de Paja. $150 USD. Call 226-0119 or write to kathybereza@hotmail.com to register. February 23. Visiting artist Kelly McGuire joins Mark Mulligan. 5pm, at La Palapa Griega. February 24. Día de la Bandera Mexicana. Dia de la Bandera Celebration. 5:30pm, Tequila’s Restaurant. February 24. 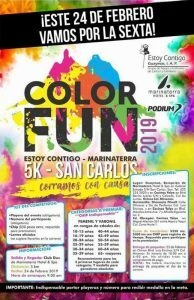 Color Fun Run. February 24. 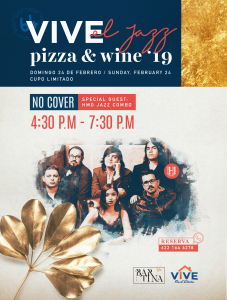 Jazz, Pizza & Wine. 4:30pm – 7:30pm, La Bartina 64. February 24. Embodied Wisdom. Reflection and discussion of Yoga philosophy and paths of freedom. 3 – 5pm, Casa de Paja. Followed by Kirtan, Divine Chanting at 5:30pm with Cherie Althauser. Free. February 28. 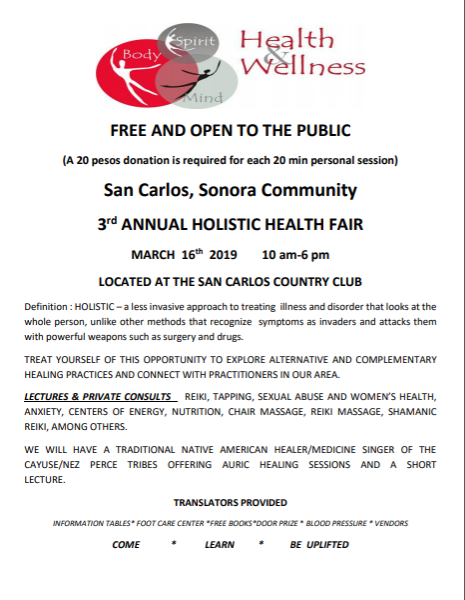 San Carlos Educational Series “Raise Awareness”. 7:00pm, Club Deportivo. February 28 – March 5. 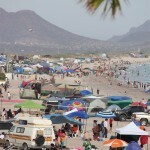 Carnaval Guaymas. March 1. Mark Mulligan. 5:00pm, Koyotl Restaurant. March 1 – 3. 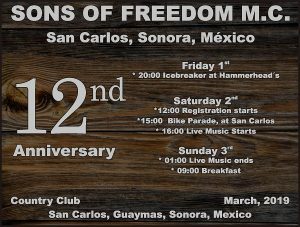 Sons of Freedom 12th Anniversary Party. March 2. Clay Sculpting Class. 9:00am to 1:00pm, Club Deportivo. March 2: Kirtan Sacred Chanting at dusk with Cherie Althauser. La Casa de Paja. Free. March 7. Club Deportivo’s annual Ceramics Show & Sale and Breakfas. 8:00am to 12pm. March 9. 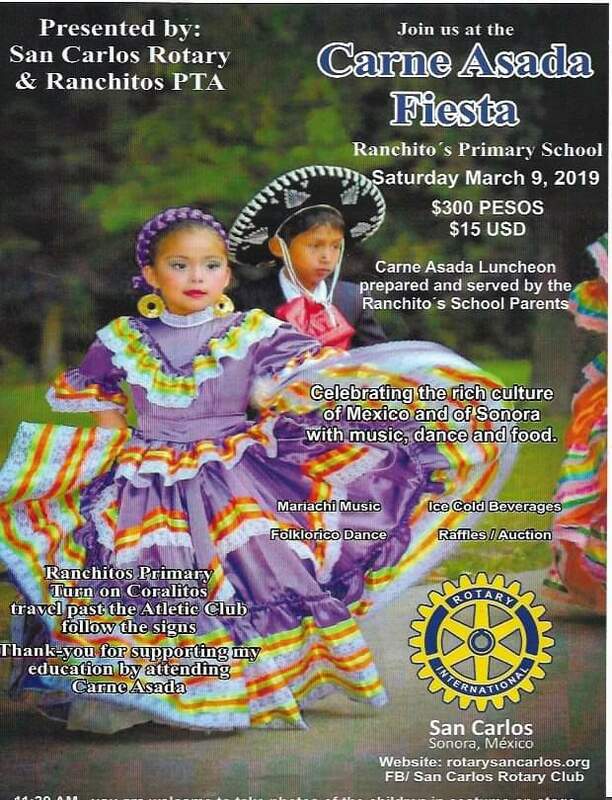 Rotary’s Carne Asada. March 9. 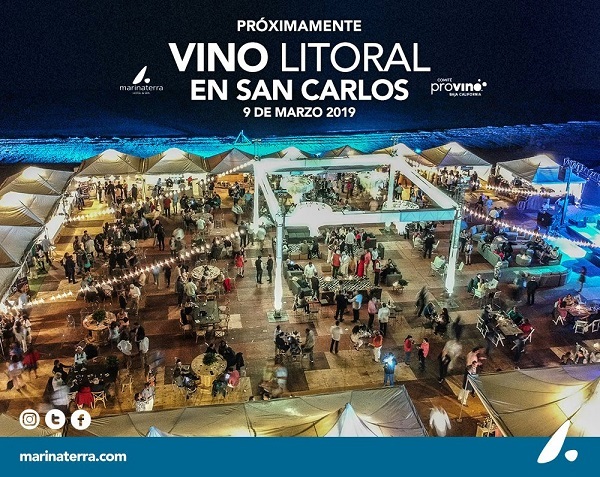 Vino Literal: Festival del Vino 2019. Club Duo. March 10. Castaway Kids Beach Party. 11am – dusk, Soggy Peso. March 14, 15 (men) and 19, 22 (women). Golf Club Championship (March 26: last day for Tuesday Ladies Day. March 28: last day for Thursday’s Men’s Golf). March 15, 16 & 17: Therapeutic & Classic Iyengar Yoga Workshop with Deborah Bristow. La Casa de Paja. $150 USD. Call 226-0119 or write to kathybereza@hotmail.com to register. March 16. San Carlos Community Church Women’s Retreat. 9:00am to 3:30pm. March 16. 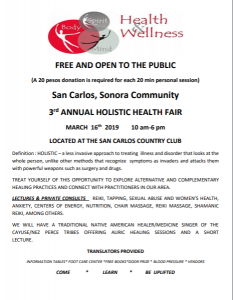 Holistic Health Fair. 10:00am – 6:00pm, San Carlos Country Club. March 16. SBPA Bag of Books Sale. 10:00am – 2:00pm, Altered Tails Book Shoppe. March 16. Art Walk. 10:00am – 2:00pm, Plaza las Palmas. March 16. 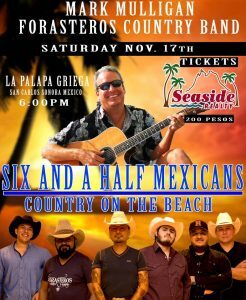 Mark Mulligan with special guests from Forastero Country Band. 5:00pm, La Palapa Griega. March 17. Gary McKee St Patrick’s Day Golf Tournament. March 17. 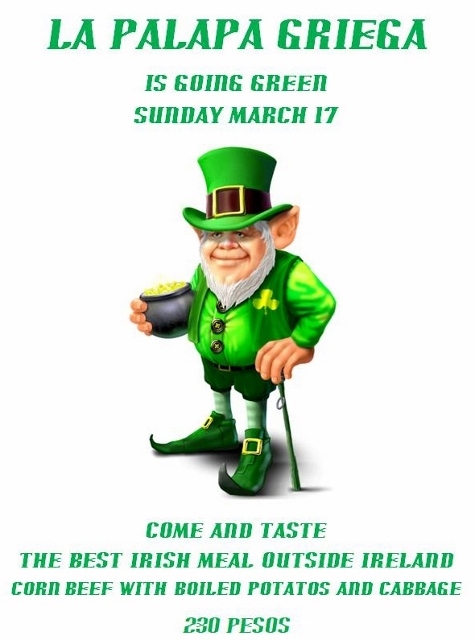 St Patrick’s Day celebrations in restaurants around town. See list. March 18 (3rd Monday in March) — day off to commemorate Benito Juarez birthday on March 21, 1806. March 19. World Opening Invocation with Phil Cash Cash. 10:00am, Playa Piedra Pintas. March 22. 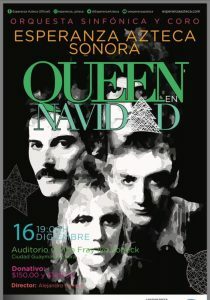 The Legends of Rock Concert. 2:00pm, Soggy Peso. 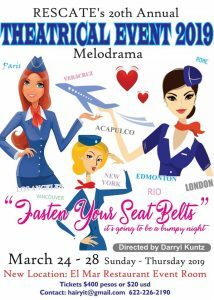 March 24 – 28. Rescate Theatrical Event. 7pm, El Mar Restaurant (back room). March 24. 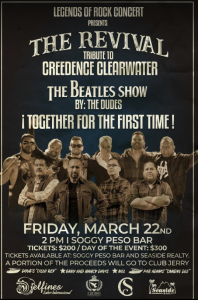 Esperanza Azteca Retro Concert. 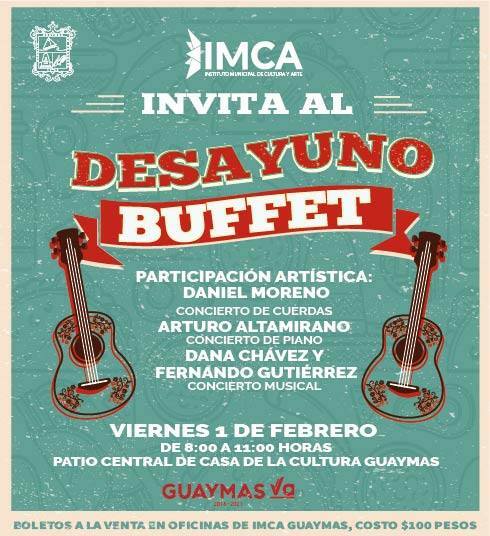 6:00pm, Guaymas Auditorium. March 28. Cabezas de Loro House Concert. 1:00pm. March 30. Concert. 5:00pm, the San Carlos Community Church. March 30. Visiting artist Thom Shepherd joins Mark Mulligan at La Palapa Griega. 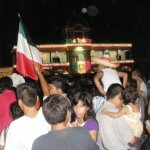 Looking for Mexican Holidays, fun events, festivals and fiestas for your vacation? 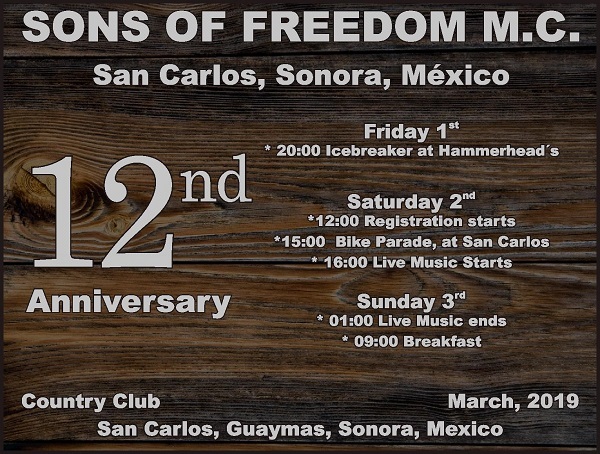 All year long, there’s something fun going on in the beach towns of San Carlos and Guaymas, Sonora, Mexico. 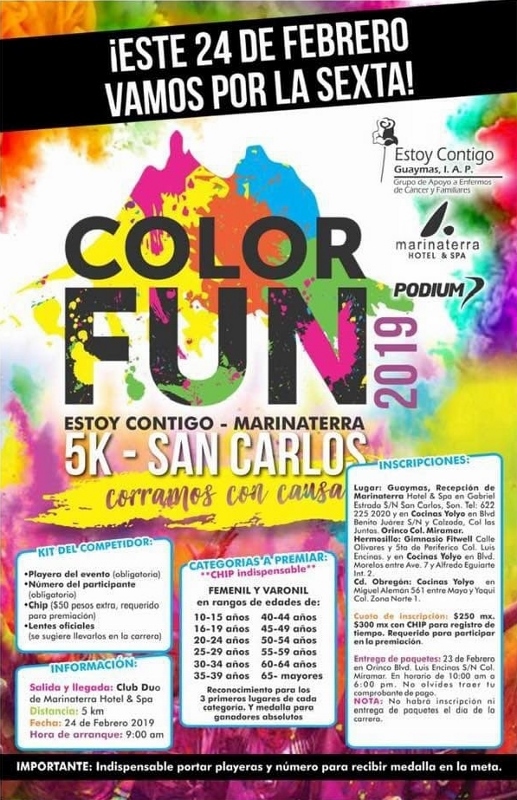 Events San Carlos is a list of the major annual Holidays, Festivals and Fiestas and special events in San Carlos & Guaymas, Mexico. Whether you’re looking for information on a Mexican Holiday or holiday, you’ll find it here.